I received one of my favorite pieces of mail today. 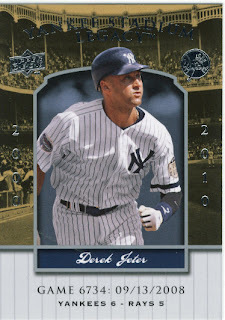 The kind of mail that comes from Jeffrey at Card Junkie and usually contains some Yankee Stadium Legacy goodness. Mail day definitely delivered the goodness, with two Yankee Stadium Legacy cards inside. 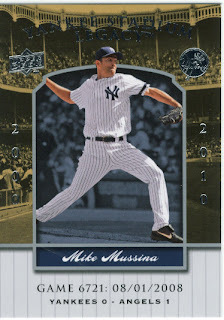 I got a Derek Jeter, and a Mike Mussina card both from the 2009 Upper Deck. One thing I noticed about these is that the writing across the top is smaller this year than last years cards. No big deal, just an observation. Jeff's cards went out in the mail today, so keep your eyes peeled next week buddy. He is a great guy and trader so stop over there and check out his blog. Just a note for everyone: Post office is closed Monday, so don't get giddy about picking up the mail Monday. Just wanted you to know your post absolutely made my day! I got home late from work. Empty mailbox. No email. 2 measley YouTube views of my latest videos. No comments on my blog. I was like why do I even do this and then, just as I was about to turn my computer off, I saw your post at the top of my links list and I was bouncing for joy. Thanks Marie. You're the bestest. I think everyone was out Valentining yesterday. There weren't a lot of comments on anyone's blog (well, except for Mario's, of course).